The MimioProjector 3200Li replaces the old lamp light projectors with its laser technology. The laser projection guarantees a more brighter and vivid display and requires no maintenance with its long life span. The 3200Li combines the power of both the ultra-wide and ultra-short throw technology in making a fine product. The ultra-short throw technology prevents the light beam shine and the ultra-wide display supports a massive 11 feet vivid display. With 3,000 lumens of brightness and 23 laser diodes along with a capacity of 16.7 million colours, the projected images are both clear and concise and close to perfection. The 3200Li model features 2 interactive stylus that allows content navigations and interaction with he projected display. Providing a platform for collaborative learning and making learning easy for student, the MimioProjector further offers a complete software license of the MimioStudio. The MimioStudio creates a collaborative learning environment that engages students in activities and assessment. The projector packs numerous ports such as the HDMI, VGA, LAN, USB etc. for easy connectivity with PCs and external mediums Moreover, the 3200Li features Ethernet connectivity and provides an audio input and out support along with a set of stereo 8 watt speakers. The MimioProjector 3200Li comes equipped with the latest laser technology that results in a better and more vibrant display. It also gives longevity to the operational life of the projector, making this Interactive Projector a good investment for your classroom. 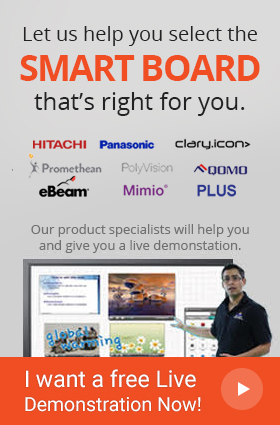 The Projector features an ultra – wide display 11ft and projects high quality images with sharp colors. With its features, the users get the brightest result in a resolution that is close to high definition displays. 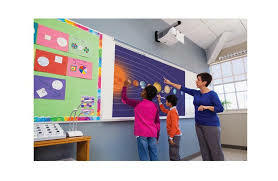 The Interactive Projector incorporates a set of stereo speakers with audio ports that covers the whole classrooms, eliminating the need of buying speakers separately for the classroom. The Projector supports connection with all the popular operating systems such as Windows, Mac or Linux. It also comes with the standard internet connectivity which allows users to store and conveniently share their work over the internet. 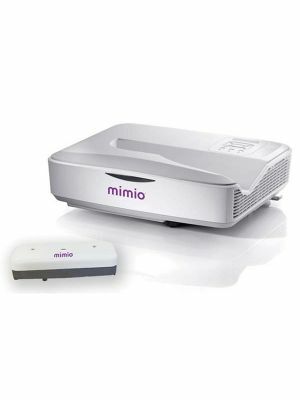 The MimioProjector comes with a software license that features the latest MimioStudio Software Suite, allowing a collaborative learning experience. Q: Can you connect MimioProjector 3200Li Interactive Ultra-Short Throw Projector with other devices? A: Yes, as MimioProjector 3200Li Interactive Ultra-Short Throw Projector has packs analog and digital ports such as the VGA, USB, and the HDMI integrated within its design providing the user with several connectivity options. Q: In what other ways does MimioProjector 3200Li Interactive Ultra-Short Throw Projector support collaborative learning? 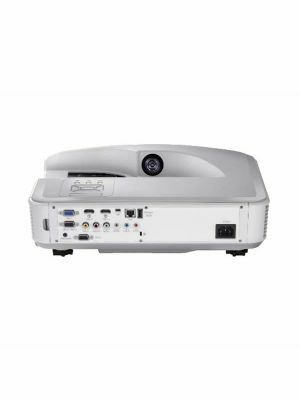 A: MimioProjector 3200Li Interactive Ultra-Short Throw Projector comes with the latest MimioStudio software that comes packed with several tools that help teachers to provide the students with an engaging classroom environment. Q: How has the mimioprojector been made more convenient for the user compared to its other alternatives? A: MimioProjector 3200Li Interactive Ultra-Short Throw Projector comes with a wall mount that can be used as a ceiling mount. Moreover, it comes with 2 interactive styli and even allows Ethernet connectivity as well as LAN connections! Q: How does MimioProjector 3200Li Interactive Ultra-Short Throw Projector guarantee the outstanding quality of the displayed content? A: The projector displays an image with 3,000 lumens of brightness and brilliant color reproduction with 16.7 million colors. It even comes supported with a digital light processing technology (6-segment color wheel), an innovative feature which completely ensures that the quality of the displayed image is top-notch. Q: Does the MimioProjector 3200Li Interactive Ultra-Short Throw Projector have a warranty? A: Yes, it has a 2-year warranty.